So they say it's good to practice heel toeing on the street. Except there is no way that you are applying as much brake pressure on the street as on the track! My issue is during hard braking, say downshifting from 4th to 3rd or 3rd to 2nd, it seems like I either get the lurch forward from too much blipping, or not enough blip and get a slight rear wheel lockup. I think the issue is that the gas pedal is too high when I am braking hard. Another thing that happens to me occasionally is that from 3rd to 2nd, I keep partial gas pedal while braking even after the heel toe is complete, making me freak out why I am not braking quickly enough!!! Can the pedals be moved? Or do I need an aftermarket gas pedal? By the way, those Federal 595 RS-R tires are phenomenal! I now have 10 heat cycles in them and they have amazing grip, somewhere in the 34-35 psi hot range. Higher than that, and they get a little greasy. They seem to be wearing nicely too. I think the issue is that the gas pedal is too high when I am braking hard. Another thing that happens to me occasionally is that from 3rd to 2nd, I keep partial gas pedal while braking even after the heel toe is complete, making me freak out why I am not braking quickly enough!!! Can the pedals be moved? Or do I need an aftermarket gas pedal? 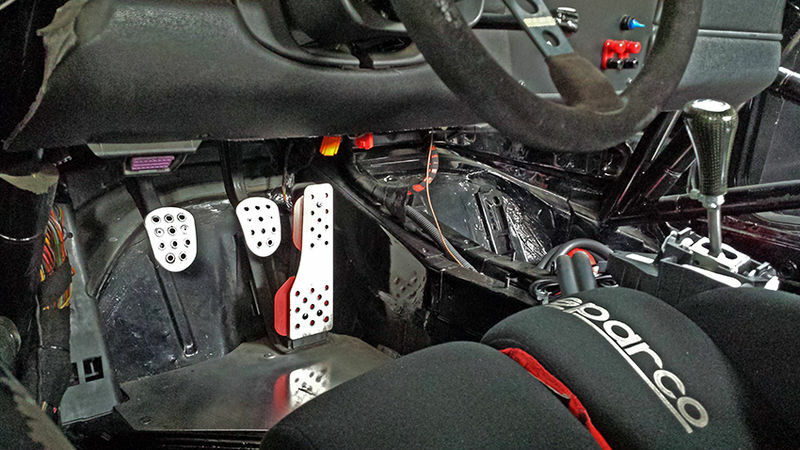 The stock pedals cannot be moved or adjusted. Is your throttle too high? My problem was that the throttle was too low and it was almost impossible to roll my foot over far enough to reliably hit the throttle. I talked to a few racers and they recommended a throttle lifter plate. With the throttle pedal adjusted up, I had no problem heel and toeing. I still use it in my Spec Boxster today. See it here: Rennline Adjustable Lifter Plate-Rennline, Inc. I also installed the throttle extension to make it easier to reach the throttle so I can more easily get to the throttle by using the outside of the upper portion of my foot or using the heel: Rennline Throttle Extension - Heel Toe-Rennline, Inc. I hope this gets you pointed in the right direction. Last edited by thstone; 10-29-2017 at 07:58 PM. What helped me to get heel/toe down was practicing on Forza with a Fanatec Wheel and clubsport pedals, that have a load cell for the brakes so it is very realistic. I was trying to learn Sebring, and was also working on my heel/toe, and I must have done dozens (maybe hundreds? but dozens for sure) Heel/toe downshifts and it really helped give me the muscle memory for the right sequence of motions. Prior to this I had the experience that my left would would not release the clutch if my right foot was on the brake still, and so I ended up giving it gas and going into gear as I finished my braking. Disclosure - I have a pedal extension - I have actually had two - the first one was quite big, and I got to where I didn't need it, so I moved to a smaller one. I have pretty wide feet too. The first one I had was the double extension, and then 2nd one was the "regular" extension. The height of the brake pedal can be changed by adjusting the brake pedal pushrod located behind the master cylinder. As you mentioned, the right height for the street won't be what you want on the track. are you actually using heel toe, or side of foot? I roll over and use the side of my foot mostly. I think that is my problem too. A suggestion, don't just blip and dump the clutch. If you nail the blimp and dump, as you were saying, it works perfectly, but in the heat of a race, things are not perfect. What I've been doing lately is blipping the gas, but not taking my foot completely off the gas, leaving it revved up a little bit and at the same time letting the clutch out slowly, not just dumping it. If you do this, the transition is very smooth and you can usually instantly feel if you've over accelerated or under accelerated and can correct any miscalculation. I am side of foot too, and sometimes I get into the gas hen I am braking, and I am like "What the heck is happening" - a couple times I have gone off, and when I get into the clutch, the car revs up like crazy. This only usually happens at The FIRM, which is a lower speed track with a lot of braking. Also I think because it is lower speed and with a lot of runoff, it is easy to push it and really explore the limits of the car. I'm not sure why but it only ever seems to happen there so I have to be really attentive about my foot placement when braking. Exactly what I said too! WTH is happening! Last edited by AZ986S; 10-30-2017 at 05:12 PM.